PHOENIX — The Apache trout, one of Arizona’s two native trout, are returning to lakes and streams in the White Mountains by May. The Arizona Game and Fish Department is scheduled to stock around 55,000 Apache trout of a catchable size (below) from its Silver Creek Hatchery from May through September. 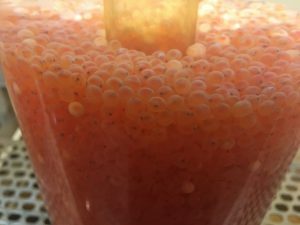 This year, AZGFD is expecting to receive about 200,000 Apache trout eggs. Subscribe to our fishing reports and stay tuned for more stocking details. Apache trout can be caught by a variety of methods, including wet or dry flies, small lures, or natural baits, in either lakes or streams. However, artificial flies produce the best results. Best natural baits tend to be worms or grasshoppers. See more information about Apache trout.